The frames demonstrate that safety and design can go hand-in-hand without either having to compromise the other. Technical Glass Products’ (TGP) new Fireframes TimberLine™ Series fire-rated frames won two architecture industry awards since their introduction in April. Heralded for its ability to combine the look of wood with fire resistance, the groundbreaking product secured accolades as an Architectural Products magazine “Product Innovation Award” winner and as a Building Design +Construction “Top 101 Product of the Year,” in the Glass and Glazing category. Winners of the “Product Innovation Award” are adjudicated by a board of 18 judges, all industry professionals, who decide which products rise above in quality, design and innovation. Building Design +Construction has a similar process where the products selected to win are graded by readers and editors based on the amount of interest, innovation, and usefulness in the design. The Fireframes TimberLine Series allows architects to create interior fire-rated glazing applications with the beautiful look of wood, while still meeting stringent fire and life safety performance criteria. The framing system is built with a high-strength steel sub-frame and real-wood veneered metal cover cap. 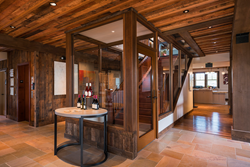 This allows the system to capture the allure of wood while serving as a barrier to radiant and conductive heat transfer. For enhanced design flexibility, cover caps are available in several wood species, including white maple, cherry, fir and oak. The Fireframes TimberLine Series can be combined with Pilkington Pyrostop® fire-rated glass to allow for unrestricted glazing in locations where the total glazing area exceeds 25 percent of the wall. This makes it possible for design teams to create interior storefronts and extensive fire-rated glazed walls with clean sightlines and a timber aesthetic. The series is available with fire-resistance-ratings up to 120 minutes for interior applications, and is classified and labeled with Underwriters Laboratories (UL). It can accommodate TGP’s Fireframes Designer and Heat Barrier Series door systems, and is also compatible with wood doors by other manufacturers. For more information on the Fireframes TimberLine Series, along with TGP’s other fire-rated framing and glass products, visit http://www.fireglass.com or call (800) 426-0279. A division of Allegion, Technical Glass Products (TGP) is your one source for fire-rated glass and framing systems, along with specialty architectural glass products. The company offers AIA-registered continuing education, project consultation, product specifications, CAD drawings, BIM 3D models and rapid-response quoting. For more information about TGP’s products and services, call (800) 426-0279, visit http://www.fireglass.com (fire-rated glass) or http://www.tgpamerica.com (specialty architectural glass and framing).